I am always wanting to have tasty vegetable sides that will be appealing to both my and my kids. 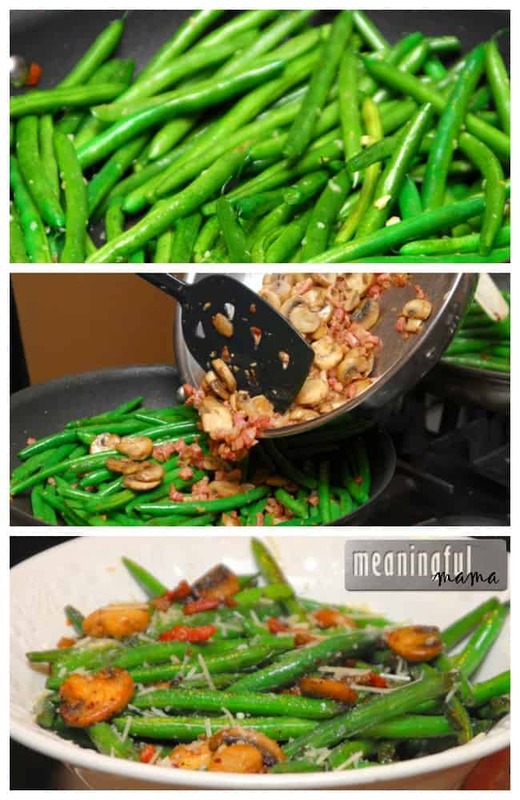 These pancetta and mushroom green beans are so tasty, and will be enjoyed by all. I think you’ll love this recipe, but if you are looking for other vegetable side dishes, you might also want to try my Spinach Salad with Boursin, Candied Pecans and Craisins or my Nutty Herbed Green Beans. This tasty side dish keeps the green beans vibrant with additions of garlic, seasoning, mushrooms and the added saltiness and flavor from the pancetta. The parmesan on top adds another great layer of flavor. I think you will really enjoy this different preparation of a favorite vegetable side dish. Wash the green beans under cold running water. Cut off the root ends and discard. Bring a large pot of salted water to a boil over medium-high heat. Add the beans and blanch until bright green, about 2 minutes. Shock in ice water then drain. Heat a large sauté pan over medium-high heat. Add the butter and garlic and sauté until butter has melted and is turning slightly golden. Add the green beans and toss a couple of times to coat. Saute until tender and crisp. Heat a separate sauté pan to med-high heat. Add 2 Tbsp olive oil and bring to temperature. Sauté mushrooms and pancetta until cooked through. Toss green beans, mushrooms and pancetta. Sprinkle with parmesan to serve. I hope you really enjoy this recipe. We make it for Christmas, and it would be a tasty vegetable side dish for Thanksgiving as well. Of course, I’d never limit making this recipe to just the holiday season.